Hypertension, also known as high blood pressure, is becoming a worrisome public health issue globally. Unhealthy lifestyles, rise in stress level, obesity, excessive alcohol consumption are the factors aggravating prevalence of high blood pressure. Measurement of blood pressure on a regular basis is important, and the trend of regular monitoring is fast catching up, which is accelerating demand for blood pressure monitoring devices globally. Globally, rapidly changing lifestyles increasing risk of high blood pressure, rise in the demand for home based blood pressure monitoring devices, and increasing in incidences of hypertension are the prime growth drivers of blood pressure monitoring devices market. 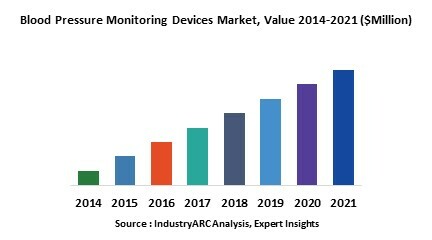 In addition, emergence of mobile-based blood pressure monitoring devices and emerging economies such as China, India and others, will create new opportunities for blood pressure monitoring devices market. However, lack of awareness regarding risk of high blood pressure and hypertension among the population in the developing countries is the key restraints for blood pressure monitoring devices market. This report identifies the global blood pressure monitoring devices market size in for the year 2014-2016, and forecast of the same for year 2021. It also highlights the potential growth opportunities in the coming years, while also reviewing the market drivers, restraints, growth indicators, challenges, market dynamics, competitive landscape, and other key aspects with respect to global blood pressure monitoring devices market. Geographically North America dominated blood pressure monitoring devices market due to higher level of awareness pertaining to blood pressure monitoring products, well-established healthcare facilities, and rising aging population. Asia Pacific is projected to have fastest growth, owing to rapidly increasing incidences of hypertension, increasing investments by manufacturers and modernizing healthcare infrastructure in this region. Among all the types, automated blood pressure monitors have the highest market share in blood pressure monitoring devices market. Home segment dominates the blood pressure monitoring devices market among all end-user segment. 14.11. GF Health Products Inc.